Custom printed for your team - Set of 4 only $89 plus shipping! 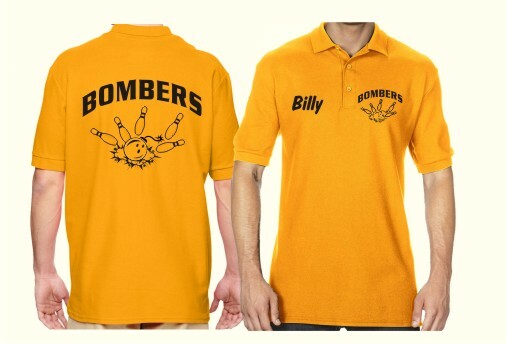 Affordable bowling shirts with large team name/logo on back, small logo and individual names on front. our bowling team is going to look great in these custom printed bowling shirts! A set of 4 is just $89 plus $14 shipping. Bowling shirts are quality "polo-style" 100% cotton piques knit collared shirts Style & color chart , and come in any color you like. Custom printed with your team name, logo, and/or mascot - large print on back of shirt and small on front AND each shirt is customized with the individual name of the team member. Print color can be white, yellow, or orange on dark colored shirts, or black, red, blue, purple, or green on white or light colored shirts. If you don't have a logo, I'll design one for you at no additional charge. If you need more than four shirts you can add as many as you like to the order for an additional $17 each. To order,please e-mail info@endangerous.com and specify shirt color, team name, and list of shirt sizes with corresponding names. If you have a logo you'd like to use, please attach it to the email. A proof will be sent by e-mail for your approval prior to printing. No payment is required until the proof is approved. Your bowling shirts will be shipped via UPS right to your door.